Join the Norfolk knitters on Friday afternoons at their NEW meeting time - 3 to 4:45 p.m. at The Norfolk Library. The fire will be lit in the Great Hall, and needles, yarn, and patterns will be available, or you can bring your own. And if you don't know how to knit, they will teach you! Everyone is welcome. 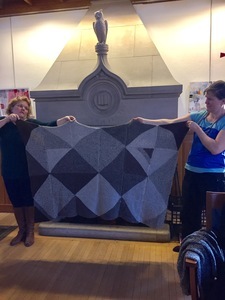 Photo 2: Shirley Metcalf and Adair Mali hold up a blanket knitted by several of the Norfolk Knitters out of donated yarn as the library owl gazes down benignly from atop the fireplace. 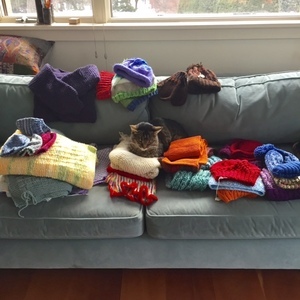 Photo 1: Kitty-approved hats, scarves, blankets and a sweater made by the Friday Knitters and ready to be donated.